JEONJU, South Korea -- South Korea has officially established an association for drone soccer, officials here said Friday, as the country aims to host an international competition in 2025. 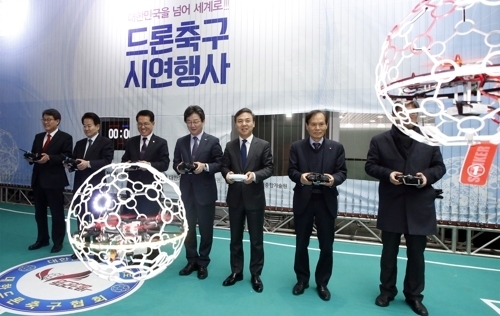 The municipal government of Jeonju said that the Korea Drone Soccer Association was officially recognized as a legal entity by the Ministry of Trade, Industry and Energy. The association is co-led by Jeonju Mayor Kim Seung-su and CAMTIC Advanced Mechatronics Technology Institute chief Yang Gyun-eui. Jeonju, located some 240 kilometers south of Seoul, is planning to host the Drone Soccer World Cup in 2025. The city government said the foundation of the new association will help its effort to host the international competition. The association said it will support fostering athletes for drone soccer, as well as expanding research and development efforts in the drone industry. The city of Jeonju has been trying to step up as a South Korean hub for drone sports, in particularly in soccer. It has so far hosted 11 national drone soccer competitions.